New Delhi, June 4: A response was always expected from the Left to the central government’s oil price hike but what the CPI(M) announced today shocked everyone. 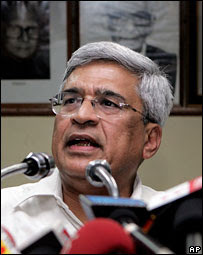 “As a protest against the central government’s move we declare a 12 hour bandh in Bengal tomorrow,” said Prakash Karat. A bandh by the CPI(M), of all the parties, left political watchers shocked as to the novelty and unexpectedness of the decision.”Who would expect the Left, of all the parties, to call a bandh?,” said Yogendra Yadav, a jholawala we caught up with at the JNU, hence an expert at this kinda stuff. “I was totally taken aback by the left calling a bandh,”says Ravi Kumar, a common man.”Politics is getting more and more unpredictable day by day. What next? Will the BJP now start a communal riot,” said Ravi, laughing at the absurdity of what he had just described. Mr. Karat also described the reasons for the calling of the bandh. “The price rise will hit the poor hard. So we have decided to call a bandh so that tomorrow the poor who earn daily wages, like daily labourers etc, do not earn even their daily allowance. I’m sure the poor will appreciate this move and realize that we are the only ones who think of the poor. Down with imperial capitalist pigs who oppress the poor!,” he shouted as a servant bought him his tea and biscuits. There are also reports of Mamata Bannerjee calling a bandh in Bengal the day after tomorrow to show that she is the only alternative to the Left in Bengal. Nice sarcastic take at things bro. Hope you can keep it up! this post is gonna do more harm than good . coz ppl's expectation are gona rise high after dis..
Down with imperial capitalist pigs who oppress the poor!,” he shouted as a servant bought him his tea and biscuits. Fantastic! I reached your blog through Greatbong's, just to take a look, and am glad I did. A suggestion: get those awful word verifications out of the comments section, and you'll see a tenfold increase in comments. All the best. //Fantastic! I reached your blog through Greatbong's, just to take a look, and am glad I did. A suggestion: get those awful word verifications out of the comments section, and you'll see a tenfold increase in comments. All the best. Thank you, anonymous(what were your parents thinking when they named you? ).I always knew greatbong would help me in some way someday. And yes, ive removed the word verification step. Let the comments flow!